Who best to greet visitors to the “Troll Capital of the World” than a smiling, one-toothed, white haired troll? 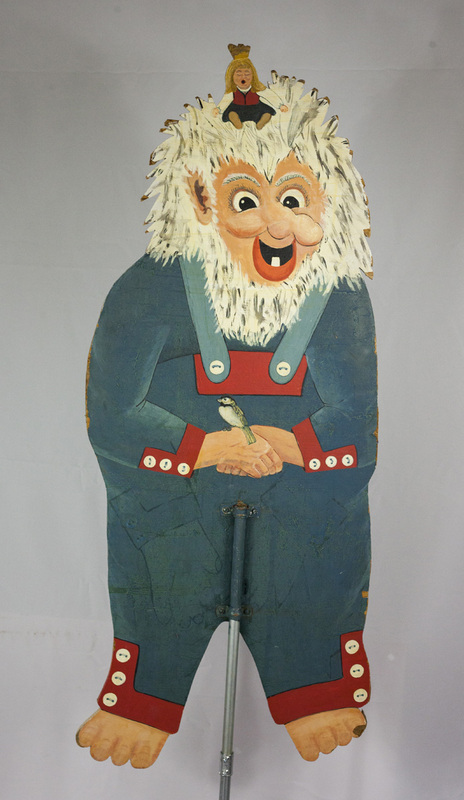 Painted on plywood by Oljanna Cunneen, this double sided, four toed troll served as a promotional piece along Main Street. With a crowned girl tucked into his hair and a bird perched on his hands, this dapper fellow reflects both Cunneen’s sense of humor and her tireless promotion of the area’s Norwegian-American identify. More than a dozen of these plywood cutouts once adorned Mount Horeb’s Main Street, dubbed the “Trollway” in the mid- to late-1980s.